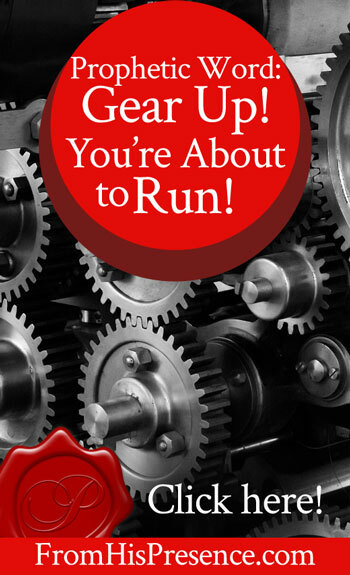 Prophetic Word: Gear Up! You’re About To Run! Have you been taking some time to rest in January? And have you been surprised because lately, despite your attempts to rest, Papa has actually been giving you more ideas than ever? You’re not alone! I have also taken January to get some rest. I mean, I’ve still worked, and worked hard–but I’ve also practiced stillness, and taken much time alone with the Lord. I’ve said no to some good things this month in order to say yes to some best things. And lately, in the receptivity of that resting state, Papa has surprised me by downloading more vision, better strategies, and more fervor and inspiration than I’ve ever had. I sense that, here in the last days of January, we are to gear up. To position ourselves where Papa shows us, and to get ready to run. Watch for more and bigger doors to open than you ever dreamed. This is an urgent time. Two days ago, my mentor prophesied to me that I have a window of opportunity to take care of some urgent things, and that window will close if I don’t walk through it. My husband and I were both struck by that, and we sense she was right. So I want to pass that prophecy along to you if you feel Holy Spirit impressing you that it is for you. Do what you need to do WITH HASTE. Things are moving and changing. Gear up! Ride the crest of Papa’s wave. It’s time to rock and roll. After the next few days, I believe you will find yourself running the race at speed. If this word speaks to your spirit today, please leave a comment below. I’d love to hear what Papa is doing in your life! Praise God for confirmation!!!! Yes, gearing up and ready to see how far the Lord wants me to go. Hello Jamie, The race is on , God is running before me and changing things around me and my family to his glory as the word says I will go before you to make the crooked ways straight. His word is fulfilled in our lives. Praise God glory hallelujah. Amen. Your blog is very inspiring. Thank you for being there for the children of God. God bless you. Amen. I believe through God’s Devine intervention I have found your blog and feel that you have been prophesing to me. Praise God! I am gearing up am ready to run for what God has called me to do. As I read your post…I cried! I knew everything you said….I have been preparing. I feel like I am nesting and lining things up in my house. Getting rid of things…money has been so difficult like never before! I know soon I will not have the time to organize things…like planning for a baby! The labor has been long, but I see the reward. There are times lately that I have had no money come in and we have gotten the largest electric bill we have ever had! I looked at it and started to laugh…I could see the attack. So I praise! I heard God tell me to be fearless…I know that very soon every is going to be so different! I will look back at this time of great fondness, as I see Daddy God preparing me for what he has for me. I keep hearing in my head that I will have 7 patent pending this year!! Claiming and praising! Thank you Jamie for your obedience and your Zeal, I am so Blessed to be part of everything God is doing through your ministry, thank you for sharing this Prophetic Word , I receive it, and I am gearing up, ready to run in the GLORY of God!! Amen. Do you know anything or believe first fruit offering is just Old Testament and is it applied today for believers in relationship to giving and financial success? Thanks in advance for your response. Thank you Jamie for that Word. Late last year I was given a Word saying that I would go into places many Christians won’t go and be a light in the dark and it was time for me to step out onto the front line of the battle field. To cut a long story short I went with my daughter in law to one of her pole dancing classes. I was required to fill out a form which confirmed my uneasiness. I filled out my form firmly stating I do not believe in some of their views. I have signed up at this same studio to take pole dancing lessons. This feels right yet at the same time scary. Please pray for me. launch into the deep was the word o heard and am trusting on the holy-spirit to help me launch deeper where my Lord want me to. Getting ready to do His will . Gearing up for the best year ever getting deeper in prayer and word . Yes I need to gear up! Holy Spirit help me to gear up. It seems I am resting too much, busying myself with so many things. My heart is bleeding with tears as I am writing. Money to get some of the basic teaching materials to grow more in His service. Going through hard financial difficulties. However I trust in Jehovah Jireh our Provider and thanking ABBA Father for miraculous breakthroughs already here but manifesting in Gods time. The enemy wants to rob and steal but I will praise and thank our God and Father for all His blessings and provision at the right time in Jesus name! Will definitely position myself to gear up! Weak at this point and need prayer for faith and strenght and to press in and press on. Jamie, May God bless you. I thank God for this encourage word.